Cooper City High’s Sound of Pride band program held their annual winter concert Thursday December 13th at 7pm, in the school’s auditorium to showcase this year’s talent. 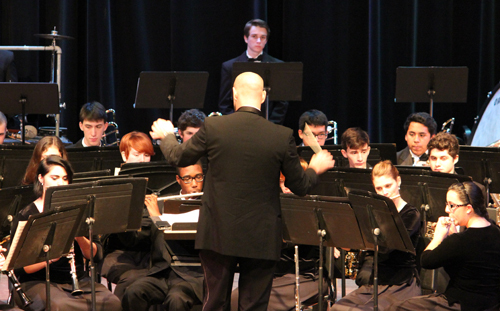 Band Director Christopher Schletter conducted performances by the Sound of Pride’s Percussion ensemble, Symphonic Band and Wind Ensemble. The Percussion Ensemble performed “Carol Of The Bells”. Symphonic Band performed 3 pieces; “Battle of Pavane” arranged by Bob Margolis, “Raymond” by Ambroise Thomas and a Christmas piece titled “Christmas Parade March” arranged by Bill Laas. The Wind Ensemble performed 3 pieces as well, “Jesu Joy of Mans Desiring” by Johan Sebastian Bach, “First Suite” by Gustav Holstz and the well-known “Sleigh Ride”. “It was a great learning experience because I was surrounded by experienced upperclassmen,” freshman Sarah Reading said. In addition to the performance, the Sound of Pride gave away raffle tickets to help raise money for this year’s program. Those who purchased tickets had a chance to win prizes such as tickets to a ballet, a blanket with pictures of the marching band and more. After the raffle, the Bleiweiss family presented Schletter, with a $1,000 donation to the Sound of Pride program. “That donation showed how much parents are willing to support the band. It was such a phenomenal gesture,” sophomore Marisol Santiago said. During the last song performed, Cooper City High’s Wind Ensemble’s performance of Sleigh Ride, people were on there feet singing along. By the end of the night, the auditorium was filled with joy and holiday spirit.